I tried finally to get rid of tables for layout. This is with respect to the layout boxes, menu on the left, etc. The main part of this site are (still) the picture galleries and I do not see a problem in presenting a bunch of pictures in a tabular way. Its sufficiently of "tabular nature" that a table should be justified. I removed all formatting from the <table> and <td> tags and put that into base.css. One even rather slim css file is valid for all pages and The top and left menu are included via Sever Side Includes (SSI). That's why right now you can't see in the menu where you are in the directory hierarchy (different color on the link or something like that). Also for the one nested Picture index (North India) it would be nice to show the additional link or exchange the menu for another one. Maybe some time. This site completely validates as html4.01 strict and css with the web Standard from www.w3c.org using the online html and the css validator service. switching off Cascading Style Sheets (CSS). This will drop all the layout but the content will be completely readable. For the India picture collection you can try to switch to the old simple layout, but I do not garantee that this is up to date or at a later time even there. I found quite a few Websites very helpful for creating this Website. 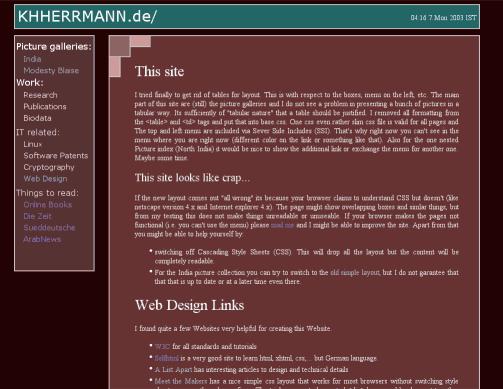 Selfhtml is a very good site to learn html, xhtml, css,... but German language. Meet the Makers has a nice simple css layout that works for most browsers without switching style sheets or any other clumsy fixes. The tricks seems to be nested <div>-boxes and borders set together with a background on the inner <div>. Since I didn't like their newspaper-layout I tried to modify the nested-<div> trick and got it working for this box-layout as well. A nice little tool to obfuscate E-mail addresses in Webpages is a 'perl-oneliner' published at linuxgazette.net.